This is the right panel of a diptych. On the left is Onoe Kikujirō II as the maidservant (Meshitsukai) Ohatsu holding an umbrella. The green 'stain' in the lower left corner is likely the original color. This image commemorates a performance in the second month of 1852. Another copy of this print is one of 116 prints which were given by a private collector to the Real Academia Nacional de Farmacia in Spain. The full diptych is shown on line. 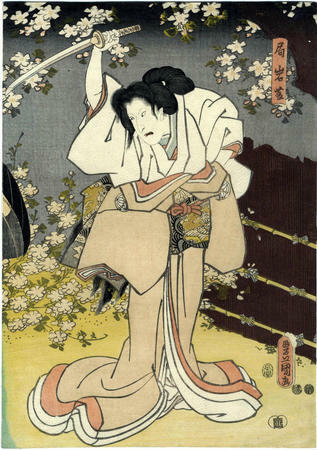 Iwafuji is the evil, female protagonist of the 18th century play Kagamiyama Kokyō no Nishikie (鏡山旧錦絵) which is a female version/rendition of the Kanahedon Chūshingura.